Website and processes: 5 Jan 16 yas, 5/5 Excellent "This is the 2nd time i have used your website to purchase a flying exp voucher. 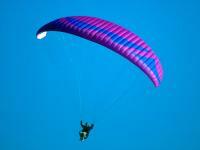 It isca great service and i was very happy"
This is effectively the first day of a full paragliding training course. After a brief introduction and detailed safety lecture participants are introduced to their equipment. Ground training and short hand towed flights complete the morning session. After a lunch that is provided you move onto the winch and progress to low flights of up to 30m. Fast learners may even get to fly a little higher. A great group day out at the UK's premier provider of free flight training. Participants must be less than 15 stone with height in proportion to weight. Each voucher entitles up to 10 people to participate in this experience. The voucher is non-transferable, which means that only the person named on the voucher can use it. The voucher remains valid for bookings for 12 months from the date of purchase. Please contact the operator	using the details printed on your voucher to arrange a date for your event.